Special Containment Procedures: SCP-737 is to be kept in a locked copper safe welded to the wall in Storage Unit ██ at Site ██. While in its safe, SCP-737 is to be placed on its side in order to prevent a containment breach. In the event of a containment breach, staff are to attempt to incapacitate SCP-737 without touching or destroying its front carriage. SCP-737 is to be provided with three (3) cm3 of wood every day via a robotic arm. Any additional carriages produced by SCP-737 are to be removed from the main body and deposited back in the safe to restrict SCP-737's movements. Description: The primary aspect of SCP-737 is the front carriage of a wooden toy train approximately three (3) five (5) centimeters tall, two (2) four (4) centimeters thick and when without carriages, four (4) six (6) centimeters long. X-ray analysis has revealed that the wooden portion of SCP-737 is an outer shell, protecting a small brain and biological tissue that make up its actual body. SCP-737 is able to independently engage in locomotion, and does so constantly when given the opportunity. 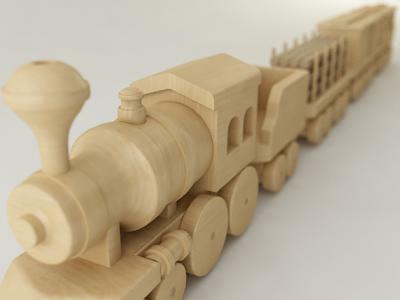 When SCP-737 reaches an obstacle, it will, through a process as of yet unknown, absorb the material directly in front of it and usually incorporate it into itself in the form of a wooden train carriage. This process typically takes five to twenty seconds, depending on the density of the material, and will leave a 'tunnel' in the object for SCP-737 to continue moving through. SCP-737 has demonstrated the ability to absorb most materials, including wood, metal, plastic, [DATA EXPUNGED]. SCP-737 seems unable to use some substances to increase its mass, and will instead convert it into a gas, which is then released from its 'chimney'. SCP-737 appears unwilling to absorb copper and its own removed segments. SCP-737 is predatory, and will favor living targets over inanimate objects. SCP-737 is likely vulnerable to damage, as the wood that comprises its outer shell shows no anomalous properties. Due to this, great care must be taken when handling SCP-737. As the chances of SCP-737 being a natural organism are extremely low, any clues as to its origin are to be reported immediately. History: SCP-737 was first discovered by the Foundation after a series of child disappearances in ███████ came to their attention when the police received testimony of 'a toy train' fleeing from the crime scenes. Mobile Task Force Mu-9 "Toybreakers" were sent in to investigate the matter, and despite losing █ of their group, were able to successfully retrieve SCP-737. Addendum 737-2: At approximately ██:██ on ██/██/20██, a containment breach of SCP-███ caused SCP-737's regular feeding time to be missed. Twenty minutes after the containment breach, SCP-737 began slowly absorbing the copper in its safe at a rate of 1 cm/hour, releasing a toxic and opaque gas from its 'chimney'. SCP-737 was quickly brought under control by the timely actions of Research Assistant ████, who described the gas as 'foul'. It now appears that although SCP-737 is unwilling to absorb copper, it does have the capacity to do so.